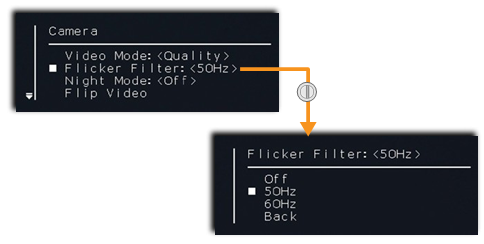 This article explains how to use the Flicker Filter feature, also known as Indoor Mode. This feature is useful for filtering out flickering caused by fluorescent light. This feature is only available in the ProSight Camera. The ProSight HX camera has an automatic flicker cancellation mode. Select Main Menu > Setup > Camera > Flicker Filter. Select the relevant setting, according to the local electricity frequency (Off, 50Hz or 60Hz).